When I am travelling, everything I see from the vehicle window is spectacle. The mountains may appear high and jagged, the river clear and green in the shadows, and the village quaint and shabby. But it is all a passing scene, a mere image that I have not interacted with except as brief observer. To come to know a place, I have found that I have to stop, explore it, and have experiences there. An example of this is Waterton Lakes National Park in the Canadian Rocky Mountains, adjoining Glacier National Park in Montana. I had heard people say it was a wonderful park, but I did not have a chance to visit it until two and a half years ago, in February. We drove into the park on a grey windy day. The townsite looked almost abandoned. The lake was grey, and the wind had whipped the water into whitecaps that were crashing on the shore. The mountains were tall but without definition in the dull light. We stepped out of the car for a closer look, but only for a moment as the wind was raw. "Well we've seen that now." It did not seem to be such a wonderful place. The next time Rob and I came to the park was on the Canada Day long weekend at the beginning of July. We drove to the park with my son and the two dogs, planning to do a day hike. It was a hot sunny day. The park looked completely different from the first time. It was full of tourists jamming the streets of the little townsite, wandering up and down, eating ice cream. The huge campground by the lake was full, with kids running and biking everywhere. The mountains looked glorious and dramatic in the bright sunshine. From our map book, we had picked out a hike that had its trailhead right near the townsite, the Bertha Lake hike. We had a bit of difficulty finding the trailhead as we initially attempted to pass through the large campground rather than circumnavigating it. Once on the trail, we found there were so many people there, it was more like a stroll on a city sidewalk than a wilderness experience. Also, we had to keep the dogs on the leash, as that is the rule in national parks. Although the scenery was lovely, we ended up only walking as far as the falls, then turning back. It was not the most enjoyable hiking experience. So you can see that my first two experiences Waterton Lakes National Park were not that positive. However, we have come back many times since then and have discovered many wonderful hiking and cycling trails. We have had lunch at the Prince of Wales Hotel. We have taken a boat cruise down the lake to Goat Haunt, Montana. We have camped in all three campgrounds, each very different. With each different experience in the park, we have come to know more about its landscape and history. We have hiked its trails, camped in the backcountry, eaten at various restaurants. We have seen it in different seasons, and in interacting with the place, it has become woven into our memories. I now have a very different and much enriched mental map of the park. It has indeed become a special place to us. I have described my experience of getting to know Waterton Lakes park as an example of the process of developing a sense of place. I believe that a person can only come to know a place through repeated experiences in that place. Too often in our travels, we race through places without stopping, or only go to attend one event. To get to know a place, a person has to slow down, walk and observe, talk to people, and have experiences there. The world seems to be more inviting and less alienating when we engage with people and places than when we merely observe from a car window or see it from our screens. 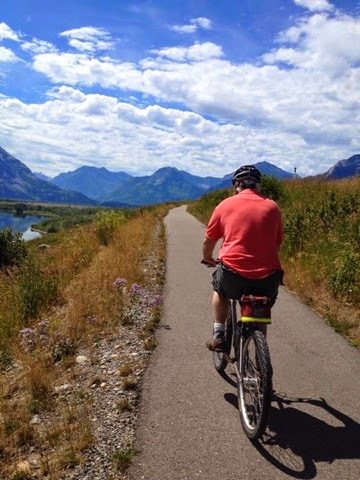 Cycling at Waterton Lakes along the Kootenai Brown trail. Somehow, I never thought this would happen to me. Retirement did not seem to be a possibility, or at least not something worth thinking about as it clearly was a decision that would be made very far, far in the future. Yet somehow time has sneaked by, and I am beginning to think about it. And now that I am thinking about it, the decision seems complicated. There are a number of factors that led me to not think about retirement. One is that I had a job that I greatly enjoyed -- a job that was not just work but a vocation that engaged me and became a meaningful life purpose. I can remember saying to a friend that I thought I would never retire. Maybe I would slow down or cut back a bit, but not fully retire. Another factor was kids. I started my family late, and my youngest just left home three years ago. Each one of them has attended university. As long as I had children at home, and then university bills to pay, retirement was not in the cards. Finances, of course, are a big consideration in timing one's retirement. In reading retirement literature, sometimes it seems that finances are the dominant consideration for most people. How much pension or other savings is enough for a comfortable retirement? Well, that depends on how long you are likely to live, what kind of lifestyle you desire in retirement (e.g., lots of international travel or being a homebody), whether you have debt, and whether you plan to supplement your retirement with some paid work. There are lots of components to juggle. For me, a number of these aspects have changed recently, and also some unexpected factors have entered the mix. Since I "crossed over to the dark side" of administration, my work has become less enjoyable, and therefore no longer something I feel motivated to continue doing into old age. Also, because my administrative work requires me to work extremely long hours, I now have little time to pursue other interests, like writing, art, gardening, and so on. The deferral of these other passions is building a pent up need to make time for them, and I can do this best by stopping work. My youngest only has one more year of university. So soon this will not be a limiting factor. I have made some good financial decisions in recent years, which has made early retirement a real possibility. Some things I hadn't anticipated also have begun to make retirement loom larger in my mind. One is that my husband is retired, and I would like to spend more time with him, doing things together that we enjoy, while we are both healthy and young enough. Another big change in these last two years is that we now have grandchildren. Both grandsons live far away. If I were retired, I could travel to see them more often, or we could even move closer to them. So you can see that I am beginning to inch towards retirement in my thoughts. But it isn't so easy. I have found that my work has me in its grip. My very identity is in large part defined by my profession, and I fear that I will lose some important part of myself if I retire. There is also the fear of the unknown. What will I do? How will I fill my hours? What is the plan? For so many years, I have been striving forward, always climbing the next mountain. How can I give up that way of being? Work has never been just a job to me. Rather, it is and always has been woven into the fabric of my life. This predilection to deeply commit myself to my work probably started way back when I began school at age six. School is the work of a child, and I did the same thing then; I embraced school and its activities with joy and intense engagement. I have written here before about how work takes such a big chunk of my time and attention that it often has thrown my life out of balance. I have written about the distress I feel when I have not enough time to do things I enjoy or am passionate about because I am giving the biggest part of my time to work. I also have written about the ways in which excessive work has a negative impact on my health. But I don't think I have described what I get out of work, and why it is such a strong focus and motivator for me. The fact is, I don't think I fully know the answer to that question. This week at work, I was trying to get things finished up prior to my summer vacation. It has been a long hard year, and I now find myself in a state of exhaustion and very much in need of a break. Usually in decades past, things would slow down over the summer as students left, the schedule of meetings eased, and most people took some holiday time. But in recent years, as everyone tries to do more with less, big projects and hiring schedules have been pushed into the summer months as there no longer is enough time to complete everything in the Fall, Winter, and Spring. So, as always happens in my line of work, my last week before holidays has been especially intense. I made a list of "must do's" -- those projects and tasks I simply had to complete before I left. These included extremely overdue reports, budget decisions, performance appraisals, requests to review and provide feedback on or to approve so that others' work would not be stalled while I was away, and meetings and training to transition certain responsibilities to others to manage in my absence. But, hearing that I was about to take some time away, staff and colleagues rushed to send things to me "to take a quick look at" before I left. (Most of this extra work came pouring in via email.) So suddenly I had a much bigger pile of work to complete in that last week. This happens every time. I know that when I come back, there will be a huge heap of work waiting for me too, all of it seemingly urgent. So where is the joy in all of this? Well, for me, it is satisfying to work through a complicated problem, whether interpersonal in nature or operational, and find a solution that allows people to start working forward again. I enjoy mentoring people, such a staff member stepping into a new managerial role, or a new hire just joining the institution. I find it interesting to take the lead in drawing others into a team to work together on developing new approaches or programs, and I love to conceptualize and design new approaches from high level systems and abstract models right down to small practical procedures. Conceptualizing, seeing the big picture, problem-solving, synthesizing, building, creating, and doing it all with people -- it's personally satisfying, and I believe it makes a positive difference, at least in my little part of the world. After a busy week, from 3:30 pm onward on Friday afternoon, having finally finished the last meeting of the day, I carefully worked through one task after another. I wrote requests, suggestions, explanations, and instructions. Then I hit send, put a line through that task on my list, and went on to the next. Yes, I had to jettison some of the tasks I had intended to complete. They will be waiting for me when I come, back. I set my proxies, drafted my out-of office message, recorded my voice mail, filed everything that was on my desk. At 8 pm, I turned off the light, locked the door, and left. It took a week's worth of 12-hour days, but I left feeling it was a job well done.